Dentures are a popular and sturdy type of restorative treatment, but they are only as stable as your daily denture care routine. 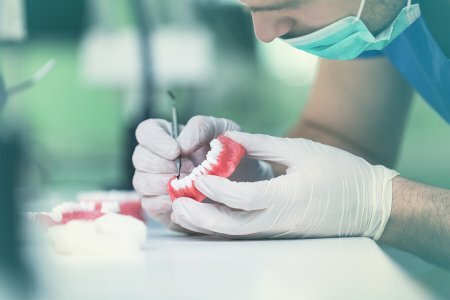 Whether you have implant-supported dentures or conventional dentures, it is important to follow your dentist’s instructions on how to care for them. Let’s take a closer look at how to care for your dentures. Denture care should consist of daily cleanings, usually with a specified denture cleaning system. You may find an over-the-counter cleanser at your local drugstore, or your dentist may have a suggestion. If you crack or damage your dentures by accident, take them to your dentist right away. Trying to repair them yourself may result in further damage or difficulties wearing them. Your dentist can recommend the right course of action to repair your dentures. Learn more about denture care in Hazlet with the friendly staff of Glenwood Premier Dental. We will work with you to develop natural-looking and comfortable dentures that could last a lifetime. Please visit us online or call us at (732) 264-4477 to speak with a dentist or staff member about denture care.